This is another great stunning template by bloggertricks.com. 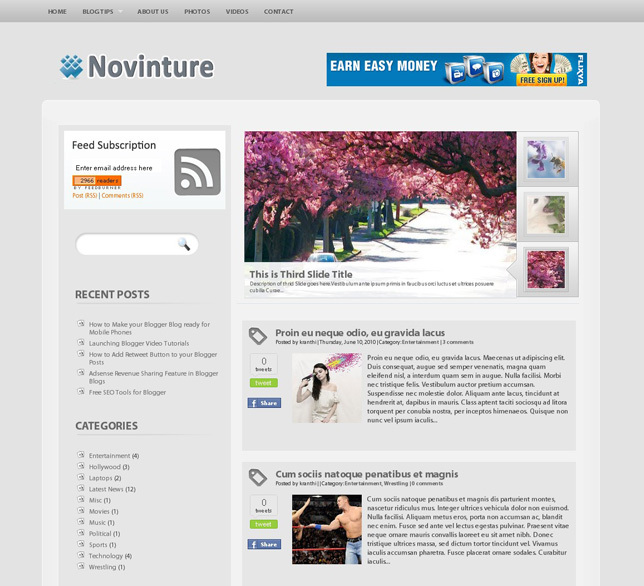 This is a magazine style template with left sidebar and 4 column footer. It already have retweet and share buttons on every post. The comments style is very professional. 1. After downloading and extracting your files, log on to your blogger and select the blog where you want to use this template. 2. Go to design tab and click on edit HTML. 3. Make a back-up first of your current template by clicking download full template. 4. Click on "choose file" then find the novinture template(it should be .xml format). 5. Then Click on upload. 1. go to design>edit html tab then tick the "expand widgets template"
Change the red color with the URL of your Logo. The blue color should be changed to your blog name. 1. In the edit html tab find this lines. Use Ctrl + f.: http://feeds2.feedburner.com/BloggerTricksdotcom then the red part change it with your feed name.